Click here to email questions about Cheer! We are a REC level program focused on FUN whose performances are judged on smiles more than precision! MU Cheer is flexible for families. We understand families with multiple activities which may mean being late or missing a practice, game or activity. There are NO PENALTIES for this; all activities are optional & we post practice videos online. Field usage fee of $9.50 paid in Registration: this fee is Millard United's best estimate of what the City of Omaha will charge for use of the fields. 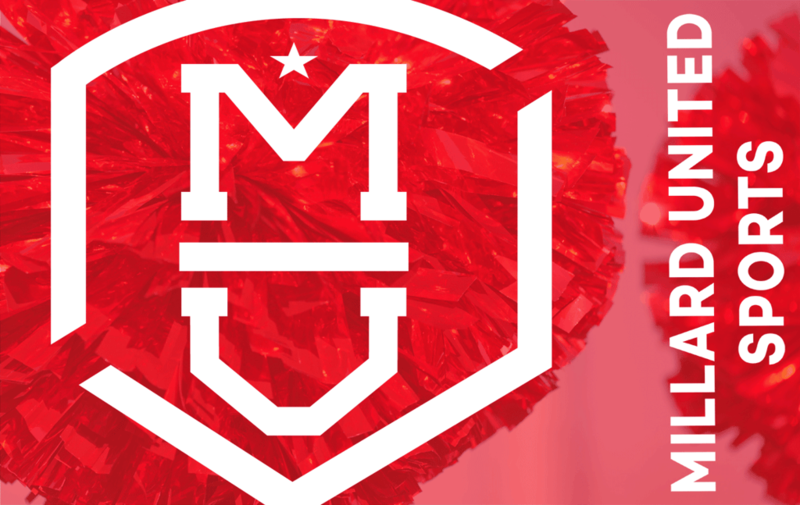 Volunteer Verification & Assurance Fee of $5.00 paid in Registration: Millard United has always considered the safety of our athletes a serious matter. As a precautionary effort, MUS has expanded upon its longtime background check policy for coaches. This fee will help offset the additional expenses incurred in the effort of safeguarding & continuing to provide a safe & fun environment for our athletes. Fundraisers Note: To keep our rates as low as possible we do require one parent to "work a shift" at either Flag Fun Day OR MUS Showcase event OR Pom My Yard. Payment Plan Options Available: There is a $5 per number of payments fee for the Payment Plan Option added to the Registration Fee. Late Fee of $25 will be added to Classic Tackle & Spirit Elite registrations after June 1st and to NFL Flag Cheer registrations after July 15th. Coach, Squad & Buddy requests are not guaranteed. Click on tabs below to learn more about each! MU Cheer Coaches at JV & Varsity divisions are AACCA Certified for Spirit Safety to ensure our cheerleaders perform stunts safely at practice and on game day.